Suitable for oral dose, this bottle of Piriton should be stored below 25-degrees and protected from light to ensure the longevity of it's relief. Ensure you deliver the perfect dosage with our range of Medicine Measures or Medicine Spoons - available to purchase here online for exceptional wholesale prices. Use the two-headed spoon provided with the syrup. Adults and children over 12 years: Take two 5ml spoonfuls every 4-6 hours. Maximum daily dose: 12 x 5 ml spoonfuls in 24 hours. Children aged 6-12 years: Give one 5ml spoonful every 4-6 hours. Maximum daily dose: 6 x 5 ml spoonfuls in 24 hours. Children aged 2-6 years: Give 2.5ml every 4-6 hours. Maximum daily dose: 6 x 2.5 ml spoonfuls in 24 hours. Children aged 1-2 years: Give 2.5ml every 4-6 hours. Maximum daily dose: 2 x 2.5 ml spoonfuls in 24 hours. 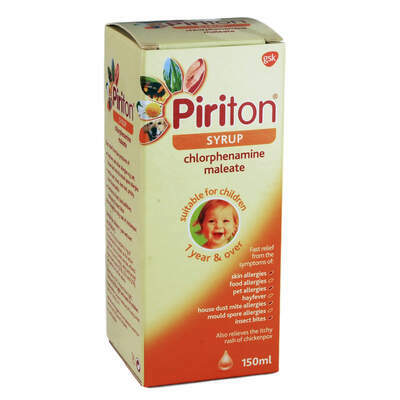 Do not take Piriton Syrup if you: Are allergic to antihistamines or to any of the ingredients listed above, Have taken drugs for depression called monoamine oxidase inhibitors (MAOI) within the last 14 days. Please see your doctor before you take the syrup if you:Have epilepsy, glaucoma, an enlarged prostate, an overactive thyroid, very high blood pressure, or heart, liver or chest disease, Are taking medicines to treat anxiety or to help you sleep.Are taking any medicine containing phenytoin for epilepsy. Taking the medicine with food and drink: As with other antihistamines the effects of alcohol may be increased. Pregnancy and breast feeding: Medicines should not be used during pregnancy, or breast feeding, without seeking advice from a doctor. Driving and using machines: If the syrup makes you feel drowsy, do not drive or operate machinery. If you take more syrup than you should: If you (or someone else) swallow more than the recommended dose, or if you think a child has accidentally swallowed more than the recommended dose, contact your nearest hospital casualty department or your doctor immediately. Do not drive if it is you that has taken too much. Take the syrup with you so that the doctor can see what has been taken. If you forget to take the syrup: If you forget to take the syrup, take a dose as soon as you remember, unless it is nearly time to take the next one. Never take two doses together. Take the remaining doses at the correct time. Most people taking the syrup find it causes them no problems. Children and the elderly are more prone to side effects. The most common side effect is drowsiness. This drowsiness can be helpful if symptoms are particularly troublesome at night. Occasionally some people may have difficulty concentrating; blurred vision; loss of appetite, indigestion or upset stomach, feeling or being sick; diarrhoea, tummy pain; liver inflammation (which may make you feel weak, sick and turn yellow); difficulty in passing water; headaches; dry mouth; dizziness, palpitations (feeling your heart beat), fast or irregular heart beat, low blood pressure (you may feel faint), chest tightness; thickening of phlegm; blood disorders (anaemia); allergic reactions including itchy rash, skin peeling, and sensitivity to the sun; twitching, muscular weakness and inco-ordination; ringing in the ears; depression (low mood); irritability or nightmares; children may become excited and the elderly may become very confused. If you are concerned about these effects, or if the syrup affects you in any other way, stop taking it and talk to your doctor or pharmacist. 2 mg of chlorphenamine maleate as the active ingredient. The syrup also contains sucrose, glycerol, ethanol, tingle flavour, peppermint oil, water and, as preservative, a mixture of methyl, ethyl and propyl hydroxybenzoates (E218, E214 and E216). The syrup contains sucrose. Diabetics should take care when using the syrup. Long term use of the syrup could increase the risk of tooth decay, so clean your teeth regularly. If you have been told by your doctor that you have an intolerance to some sugars, contact your doctor before taking the syrup. The product contains 6.3% v/v ethanol (alcohol), i.e. up to 515 mg per adult dose, equivalent to 13 ml beer, 6 ml wine per dose. Harmful for those suffering from alcoholism. To be taken into account in pregnant and breast feeding women, children and high-risk groups such as patients with liver disease or epilepsy.